Private residential prices declined 0.6 percent in the three months ended March 31 from the previous quarter, when they fell 0.1 percent, the Urban Redevelopment Authority said Monday. Luxury home prices, or residences located in the prime areas, dropped 2.9 percent, the most since the quarter ended June 2009. 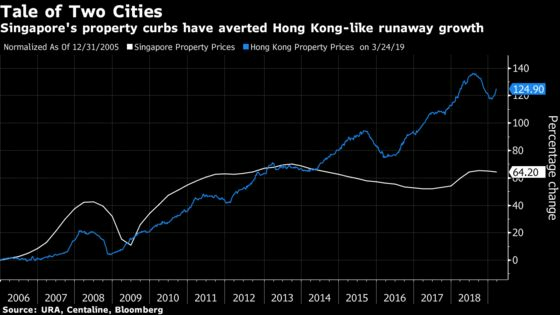 Singaporean authorities have kept a tight leash on the property market since the early part of the decade in a bid to avoid runaway price growth like in Hong Kong, which holds the unenviable title of the world’s least-affordable housing market. The government in July imposed higher stamp duties and tougher loan-to-value rules to choke off a sudden bout of exuberance. It has since cracked down on “shoe-box” apartments, limiting transactions at the cheaper end of the market, while anti-money laundering rules have imposed an additional administrative burden on developers.